Students and engineering academics from City, University of Ljubljana, Budapest University of Technology and Economics, University of Zagreb and Bristol-based BetterLife Innovations Ltd – will unveil the product design of a lightweight and easy-to-use mobility scooter. City, University of London will host the Final Workshop of the 2017 European Global Product Realisation project (EGPR) from 11th to 20th June. 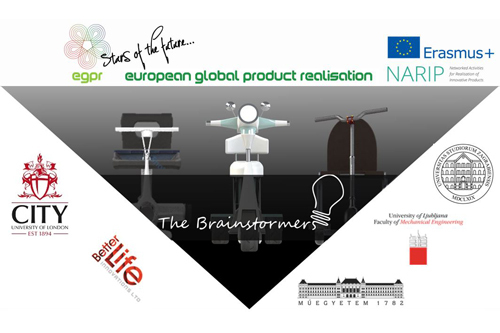 On 19th June, the collaborators on this year’s EGPR project - students and engineering academics from City, University of Ljubljana, Budapest University of Technology and Economics, University of Zagreb and Bristol-based BetterLife Innovations Ltd – will unveil the product design of a lightweight and easy-to-use mobility scooter, suitable for various target user groups. The EGPR programme is an academic virtual enterprise, comprising the above-mentioned partners. It is supported by the EU-funded Networked Activities for Realisation of Innovative Products (NARIP) under the ERASMUS+ KA2 Strategic Partnership Grant Agreement. The closing workshop programme will be broadcast via videoconferencing technology to all participating universities in the project. Students, staff and visitors will be also be invited to pose questions. This long term collaboration with universities across Europe is a proven model for preparing our students for their career as engineers for 21st Century. They learn to innovate, collaborate and lead across boundaries and are able to respond to challenges of our industrial partners. We are extremely thankful to BetterLife Innovations Ltd for an opportunity to work on this assignment and are hoping that some of the concepts and prototypes developed by the students this year will reach the market and benefit a wide variety of interested users. The Erasmus Programme (European Region Action Scheme for the Mobility of University Students) is a European Union (EU) student exchange programme established in 1987. Erasmus+, or Erasmus Plus, is the new programme combining all the EU's current schemes for education, training, youth and sport, which was started in January 2014. The Erasmus Programme, together with a number of other independent programmes, was incorporated into the Socrates programme established by the European Commission in 1994.